Sorry I haven't blogged for a while - I blame my lazy human! Anyway, I wanted to show you a picture of my new friend Indie. 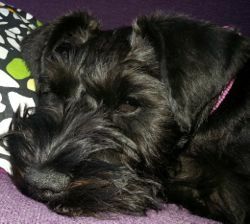 She's a rescue dog, and she's the same age as her sister Phoebe, who's a miniature Schnauzer just like me! I don't have a picture of Phoebe, because my human is really slow with dragging her phone out of her pocket and getting the camera bit to work. But she did get this picture of Indie, who has the most amazingly long tongue, and even Indie's human's not sure how she fits it all into her mouth! But I know how she manages... she doesn't keep it in her mouth at all, she lets it hang out all the time! Oh Sasha, we have missed you SO much. Humans are - well - not realiable at all are they?! He he he! Indie is gorgeous - we DO love a brindle girl! And that tongue - it's amazing, stupendeous, fabulous! What a pawsome photo! But next time - a photo of you also please to feast our eyes on - we're really feeling the absence.....sigh!!! I've missed you! 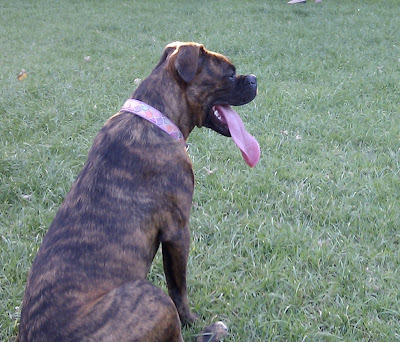 Indie is very pretty & has a crazy tongue. 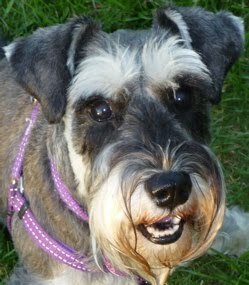 Hi Sasha, I would have thought a clever schnauzer like you would have already sorted out any of your human's laziness by now!! I have been pining to hear from my fellow Aussie girl - and what do I get - Indie!! 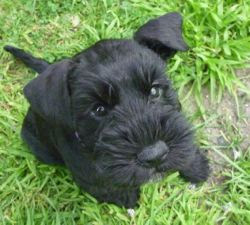 Sure she is cute enough, but she ain't no schnauzer. Tell your human to stop torturing us and give us a real update! 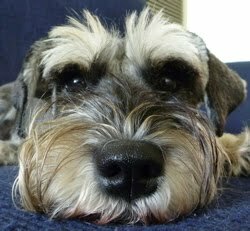 Schnauzer style. Humpf. I'm not allowed to use twoofer so I am relying on your blog. P-l-e-a-s-e !! Tail Wuggles, Rubie. Seems like a lot of dog bloggers are having trouble with 'the help'...glad it's sorting itself out. Indie's tongue is a record breaker for sure. Nice to hear from you, Sasha! And wow - that IS some tongue!! !